Have you heard the news over at The Catholic Gift Shop? 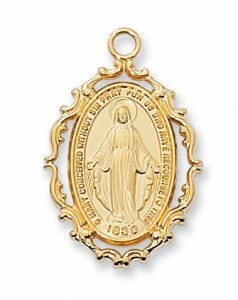 Tomorrow, Friday December 16th, The Catholic Gift Shop will be giving away three of their best selling medals. All they ask is you visit their page on Facebook and “like” button, and become a fan of The Catholic Gift Shop. There will be three drawings: 10 am, 2 pm and 6pm ET. The winners will be selected from the shop’s fan base on Facebook. 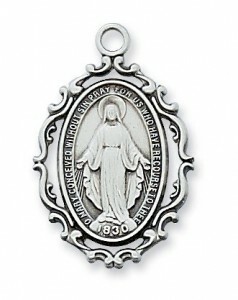 Right here, by clicking this link, you can become a fan of The Catholic Gift Shop. All the medals will be shipped Friday night and will arrive in time for Christmas! Here is the first medal to be be given away on Friday. 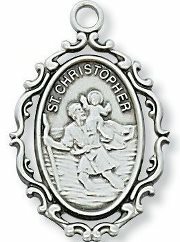 The Saint Christopher medal in particular has been one of the biggest sellers at The Catholic Gift Shop all year (these medals are all new in 2011). These are terrific medals — which are on sale at The Catholic Gift Shop. 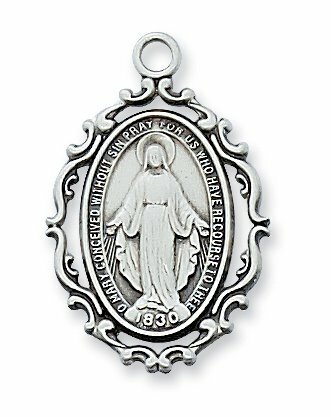 The two sterling silver medals are being sold for $54.95 and the gold-filled Miraculous medal sells for $64.95. The Shop is giving them away for free.